We may be in the throes of winter but you can’t beat a bracing walk in the elements along Cornwall’s coastline. One of our favourite routes is Hall walk, a three mile route from Polruan to Bodinnick, which takes about two hours to complete. It is a moderate walk, with plenty of vantage points along the way. 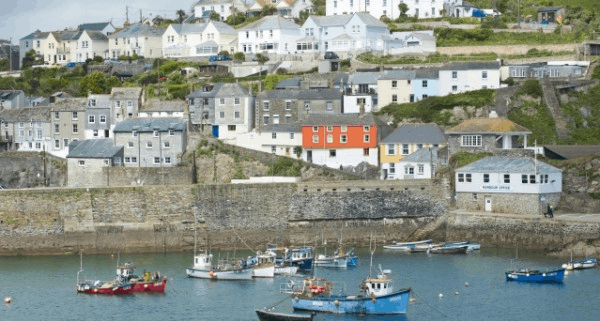 We recommend that you start in Polruan and finish in Bodinnick, so you can treat yourself to a rewarding pitstop at The Old Ferry Inn. This original walk was designed as an Elizabethan promenade for Hall Manor, which was built just above Bodinnick for an influential Cornish family in the 13th century. It is probable that the walk would then have included only the stretch of land round Penleath Point, but extended in later years to its present length. We’ve mapped out the journey to avoid any wrong turns. The Old Ferry Inn at Bodinnick, Fowey. 1. Catch a ferry to Polruan from Fowey. It is the fastest route to the village and takes just 15 minutes to cross the estuary. Depending upon the time of year, the ferry leaves from either Town Quay or Whitehouse, which is just off the Esplanade. Once you’re back on dry land walk past The Lugger Pub on the right, turn left into East Street marked with a signpost, ‘To the hills’. 2. At the first set of steps, bear right up some further steps. Walk alongside a metal handrail between cottages. Where the handrail finishes, walk on for a few yards and then bear left, up the concrete steps to eventually follow a narrow track . 3. The track passes viewpoint benches, one of which is at a fork in the track. This provides a great opportunity to catch your breath and soak up the views. When you’re ready to get going again, keep to the higher track (right) and follow the naturally winding route through the woods. Turn right onto the road and then after a few yards bear left onto a further woodland track signed for Pont and Bodinnick. 4. Follow the signs and the main track to Pont where the beauty of the tiny harbour will take you in. A number of writers have lived and worked at Pont Creek including Kenneth Graham who was inspired by its unique peace. 5. Cross the Pont footbridge and walk to the edge of the woods, veer to your right to find the path again. Take a sharp left to walk on the other side of the creek. Follow the woodland path until you come to a gate and a field. 6. Walk along the bottom of the field and you will find some breathtaking vistas. You are approaching Penleath Point, which is marked by the ‘Q’ memorial, in memory of the writer Sir Arthur Quiller Couch – otherwise known as ‘Q’. You may also be familiar with ‘Q’ in relation to Daphne du Maurier who famously lived and wrote in Fowey. ‘Q’ was co-author of Castle Dor; his unfinished manuscript was passed to Du Maurier upon his death for completion. Q is also the name of our restaurant. 7. As you look across the water towards Fowey there is a fine view of the town. Continue along the path, past the war memorial to your left and down towards a tiny gateway. 8. Turn left, this is the entrance to Bodinnick. The village has hardly changed since Daphne du Maurier first visited it. The house by the water at the bottom of the hill was her first Cornish home – the Swiss Cottage, which she renamed Ferryside. The Old Ferry Inn is just on the right as you go down the hill. After a well earned drink, you can catch the car ferry back to Fowey.